We are extremely honoured to host Professor Stefano Guido from Napoli for two weeks. He is an expert in the field of complex soft materials which is at the interface between engineering and soft matter. He will be our Keynote Speaker on Thursday, 28th August. 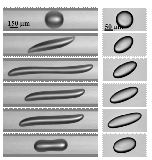 "Chemical Engineering at the interface: shear-induced deformation of droplets, vesicles and red blood cells"
The interfacial behavior of soft matter is an active area of multidisciplinary research where an approach based on chemical engineering core disciplines, such as transport phenomena and thermodynamics, can be exploited to tackle industrially-relevant problems. Here, the focus is on the interface of deformable particles, i.e., droplets, vesicles and red blood cells (RBCs), which can be considered as the building blocks of more complex, somehow similar systems, such as emulsions, surfactant solutions and blood. The morphology of these systems can be significantly affected by flow conditions, such as in processing. 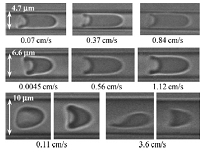 In this presentation, shear-induced deformation of droplets, vesicles and RBCs will be discussed and compared by giving special emphasis to confined flow geometries, which are encountered in microfluidics devices. Stefano Guido received a Laurea in Chemical Engineering in 1989 at the University of Naples "Federico II", a Master of Science in Chemical Engineering in 1992 at the University of Minnesota, and a PhD in Chemical Engineering at the University of Naples "Federico II" on biased cell migration in oriented collagen gels. After a post-doc he started his academic career in 1994 at the same institution, where he is currently full professor at the Department of Chemical, Materials and Production Engineering. He is also affiliated at the CEINGE Advanced Biotechnologies Center and at the Italian Institute of Materials Science and Technology (INSTM). He has been visiting professor at the Department of Biomedical Engineering of the University of Minnesota in 2003 and at the Department of Biomedical Engineering of the University of California at Irvine in 2004. He is currently involved in COST actions MP1106 (Smart and green interfaces) and CM1101 (Colloidal Aspects of Nanoscience for Innovative Processes and Materials), in the FP7 European project Synflow (Innovative Synthesis in Continuous-Flow Processes for Sustainable Chemical Production), and in the European Space Agency Topical Team on biomimetic and cellular systems. His research interests are in interfacial behavior of complex soft materials, such as emulsions, surfactant solutions, biological systems, multiphase reactive systems, and porous media, with a special emphasis on the application of microfluidics techniques. He is author of more than 80 papers in ISI journals and of 4 international patents.